I am excited to be pulling out my Fresh Squeezed Stamps again today! For this fun Christmas card I used the Christmas Treats set! I die cut the squares with Spellbinders Nestabilities, making the construction of this card nice and easy! A bit of twine from The Twinery peeks out from behind the panel offering that extra pop of green! 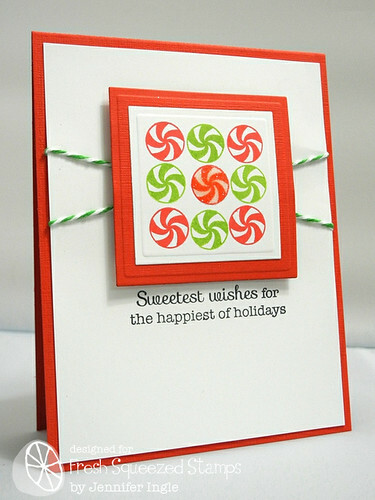 I don't often work in the red and green color scheme for Christmas, but I kind of loved it for this card! Classic and fun! I added just a bit of Glossy Accents over the center candy with some glitter to make it sparkle! 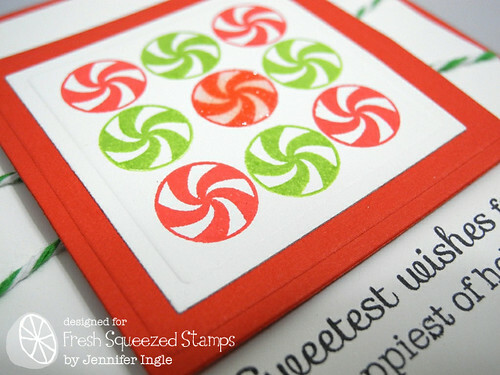 If you haven't checked out Fresh Squeezed Stamps yet, WHAT ARE YOU WAITING FOR? LOL! Seriously..super cute stamps! SO FUN! And don't forget to check out the Fresh Squeezed blog for even more inspiration! Sweet is RIGHT! So nice! This is definitely full of fun and sweetness! This is so cute....LOVING the fun peppermint wheels! This is absolutely beautiful, perfect colours for these sweeties too. The Glossy Accents and glitter on the one is GREAT! What a fab design--awesome card, Jennifer! So pretty and sparkly and yummy looking. The glossy accents and glitter are a perfect touch.